Recently a pilot wrote in to let us know about how he’s been using his RTL-SDR to receive real time FIS-B ADS-B weather updates in ForeFlight while flying in his plane. 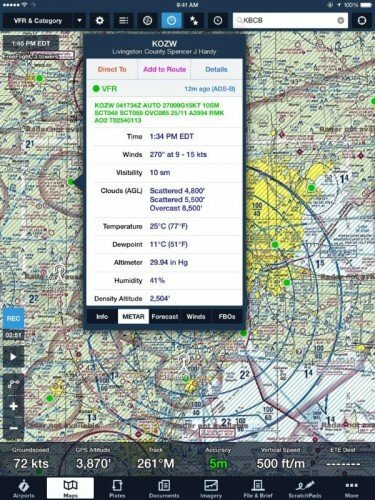 ForeFlight is an iOS app for pilots that helps with flight planning and provides access to important information like charts, real time weather reports and airport information. However, to access real time weather information usually you need to buy a $549 – 899 Stratus receiver. Now it is possible to use an RTL-SDR to receive the FIS-B weather information that is transmitted on the 978 MHz UAT frequency which is available only in the USA. UAT stands for Universal Access Transmitter and is similar to ADS-B transmitted at 1090 MHz, however UAT has some extra features for pilots compared to ADS-B. In addition to location information UAT provides a Traffic Information Service (TIS-B) which allows pilots to see what ground control sees on their traditional RADAR system. It also provides a Flight Information Service-Broadcast (FIS-B) which includes weather and other information. UAT is commonly used on small aircraft due to it’s lower cost and additional features. To receive UAT FIS-B weather information the pilot used dump978 on a Raspberry Pi 2. Dump978 is a UAT decoder, similar in operation to dump1090. He has also created a program called “Stratux“, which together with a WiFi adapter allows the decoded FIS-B data to be transmitted from the Raspberry Pi by WiFi to an iPad running ForeFlight. Running the software is as simple as piping the 978 MHz signal from rtl_fm into dump978, and then piping the decoded output of dump978 into stratux. Foreflight can then connect to the WiFi signal and work like it is connected to an expensive Stratus receiver. In the video example below you can see some weather radar animations from FIS-B data received from the RTL-SDR shown on the ForeFlight screen at around 4:29 and onwards. 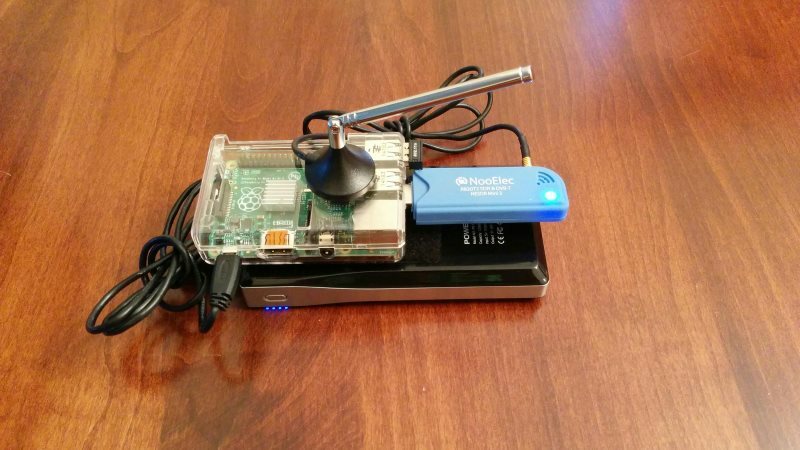 RTL-SDR, Rasperry Pi, WiFi dongle and portable battery pack for receiving UAT. FIS-B UAT Weather Report received on Foreflight from a Raspberry Pi and RTL-SDR running dump978. Just out of curiosity, does anyone have any leads on a version of stratux that would work for Avare for an Android device? Would stratux work on Avare? This website says it works with Avare.